1. Put currants and raisins in a large bowl. Cut up prunes with scissors and add to bowl. Add port and mix well. Leave to stand for 2 hours, stirring occasionally. Pre-heat the oven to slow (160C). Line the base and sides of a deep 23cm round tin with two layers of baking paper, bringing it 5cm above the rim of the tin. 2. Roughly chop butter and put in the small bowl of an electric mixer. Beat until butter is pale yellow. Add vanilla and beat for a minute longer. Pour in sugar and beat until the mixture is light and creamy. Add eggs one at a time, beating well after each addition. 3. Add the creamed mixture to the fruit. Add the rind, juice and treacle and stir to combine. Sift the flours and spices onto a sheet of greaseproof paper. Add the sifted dry ingredients and chopped chocolate, cherries and walnuts to the mixture. Stir with a wooden spoon until just combined. 4. Spoon the mixture evenly into the tin. Tap gently on the bench to settle the mixture. Smooth the surface of the cake mixture with a wet hand. Wrap a double thickness of brown paper around the tin and secure with string or a paperclip. 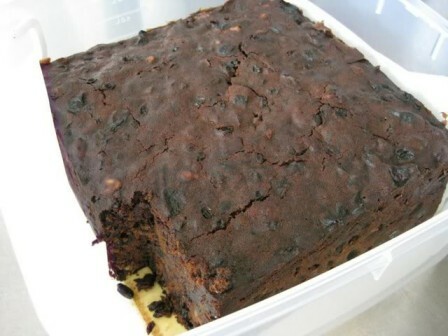 Bake for 3 – 3 1/2 hours or until a skewer comes out clean when inserted in the centre of the cake. Remove cake, pour over extra port and wrap in a thick clean towel. Keep wrapped until the cake is completely cold – this will take about 24 hours.